The commemorative plaque on the Airmen’s Memorial Seat at Whitehaven, Cumbria. On Thursday 14 October 1943 an Avro Anson aircraft (R9780) took off on a training flight from RAF Millom, Cumberland. At Whitehaven, about 30 miles to the north, the plane suffered structural failure leading to a crash and the loss of all five aircrew. It was subsequently found that there was an inherent defect in the structure, which would have been undetectable beforehand, and all similar aircraft were grounded for a time until reinforcement work was carried out to prevent a recurrence. By coincidence, Thursday 14 October 1943 was ‘Wings For Victory’ Day in Whitehaven, when Squadron Leader David M. Crook DFC –a Spitfire ‘Ace’ of the Battle of Britain handed over a plaque to the townsfolk in recognition of the Whitehaven exceeding its target to buy two Lancaster bombers. Immediately after the crash, Squadron Leader Crook and Mr John Roger Williams of ‘The Whitehaven News’ went to the site and took initially took control of the early part of the crash investigation. Although many of the townsfolk of Whitehaven and almost all the schoolchildren of the town saw the crash, because of wartime censorship there was never a memorial to the five airmen – until Wednesday 10 September 2008, almost sixty five years later. Finally, a memorial seat was installed near the crash site, arranged by Whitehaven Heritage Action group. 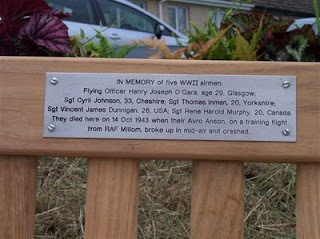 The seat was unveiled by relatives of two of the airmen of Flight R9780 and Mr Glynn Griffiths of RAF Millom Museum. “Even though I knew none of those Airmen who were so tragically killed, I felt in a sense they were there with us, looking down on the unfolding events, approvingly. It is a great comfort to know that no one is truly forgotten - who is remembered by their friends”. On 14 October 1943, five airmen based at RAF Millom, South Cumberland, boarded Avro Anson R9780 and took off on a training flight over the Irish Sea and the Cumbrian coast. Unfortunately the aeroplane would not complete its airborne journey as parts of it fell off above the town of Whitehaven and the plane crashed on the hillside at Arrowthwaite, Whitehaven with the loss of the crew. Miraculously, there was no civilian loss of life in Whitehaven. The five aircrew aboard Avro Anson R9780 that day were as follows: F/O Henry Joseph O’Gara from Glasgow, Sgt Vincent James Dunnigan of the USA, Sgt Thomas Inman of Yorkshire, Sgt Cyril Johnson of Cheshire and Sgt Rene Harold Murphy of Canada. A number of the stories posted to the BBC “People’s War” website mentioned this plane crash, including the son of Sgt Johnson and schoolchildren living in Whitehaven in 1943 who had just finished school when the crash occurred. The airmen who died that October day were all buried in cemeteries outside Cumbria. There was never a memorial commemorating the memory of the five airmen in Millom or Whitehaven, until in 2008 the Whitehaven Heritage Action Group decided to arrange the dedication of a memorial seat near the crash site. 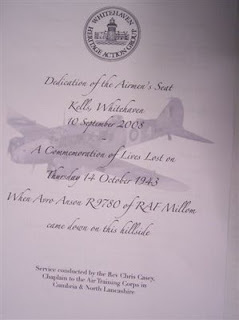 The Action Group arranged for the unveiling of the seat to be done on 10 September 2008 by Mr Glyn Griffith of RAF Millom Museum and relatives of some of the airmen. At long last, 65 years after the crash five casualties of WW2 will be honoured in the place where they died. Hopefully, all those who rest at this seat will look at the Lakeland fells and think of those whose sacrifice for freedom and security ended at this place.